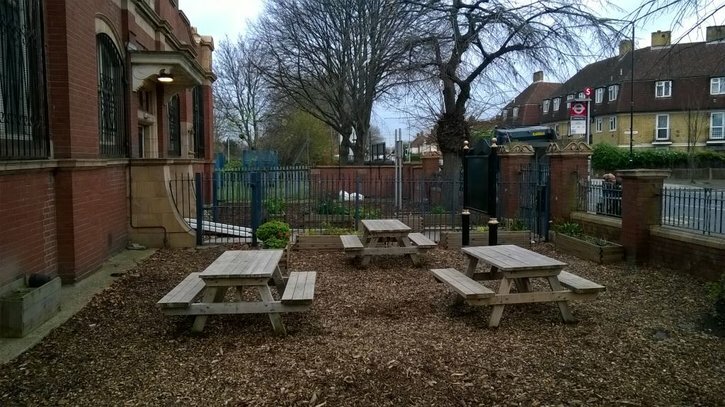 The garden of the library on Prince Reagent Lane in Newham was in need of some work to provide a new area for the public to use. The team started by clearing the site of all rubbish, and then proceeded to lay protective sheeting down to act as a weed repellent. Wood chippings were then spread over the area and the finishing touch was a donation of 3 benches that were designed by Senior Construction Manager John Sherman and made by the site Carpenter. “Just to say a big thank you to you and the Taylor Woodrow volunteers for making the front garden look amazing last week! Also we love the benches.” Sarah Dodd, Community Neighbourhood Manager. “The front of the Library is looking great, in fact I was just outside speaking to a local councillor. She was really impressed with the shape the garden is taking. She can’t wait to meet our groups outside during the summer. Let’s hope we can make excellent use of the benches. I told her about the work you guys had done for us. Thank You.” Julie Porter, Custom House Library Manager.